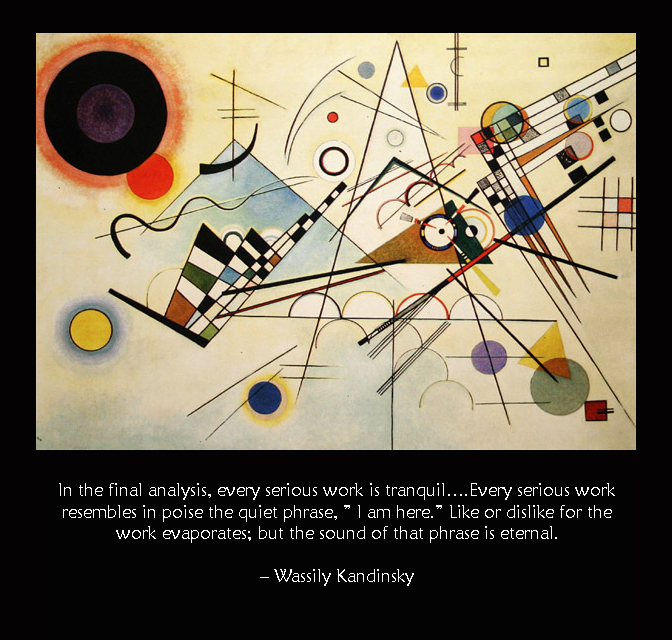 The artist has to transcend a subject, or he loses the battle. The subject wins. 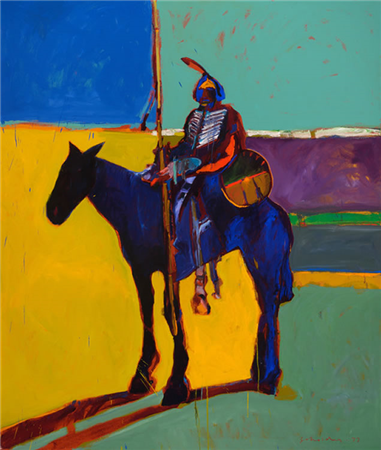 Fritz Scholder (1937-2005) was an Native American painter. I wasn’t going to use the Native part because he had claimed at one point in his career that he was not an Indian painter nor would he ever paint Indians. 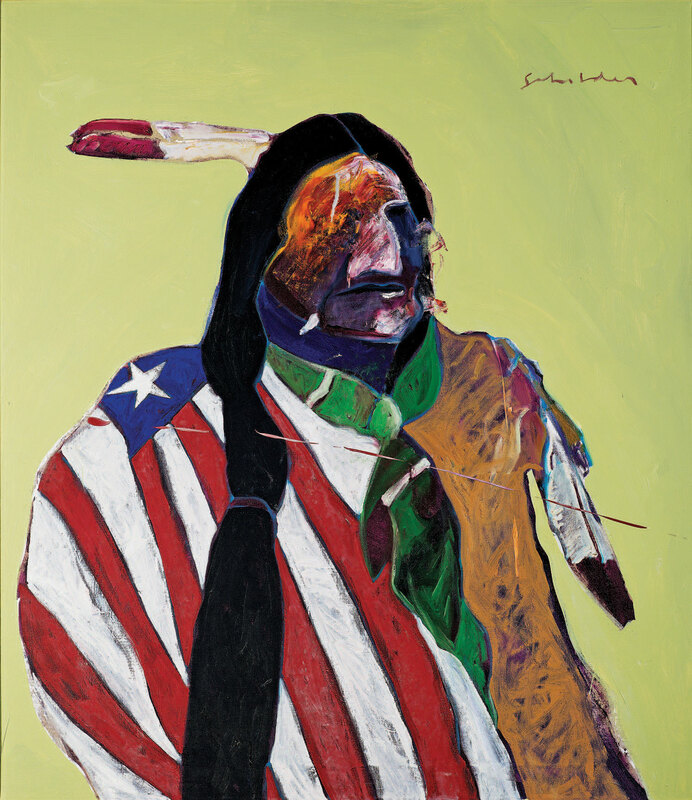 Much of his work adhered to that idea but his work, in many cases, definitely reflected his experience as a Native American. 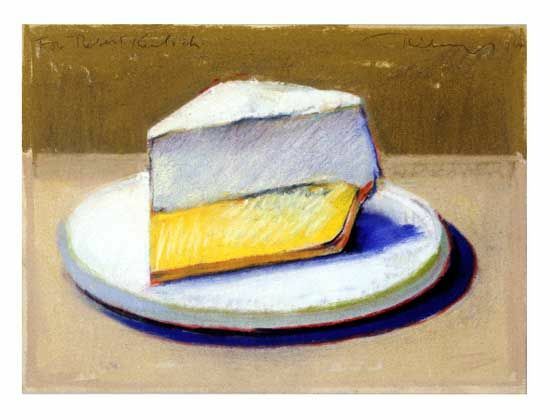 His work followed the modern trails of painters like Francis Bacon and Willem de Kooning but certainly expressed his personal viewpoint and experience. It’s great work that I always enjoy taking in. 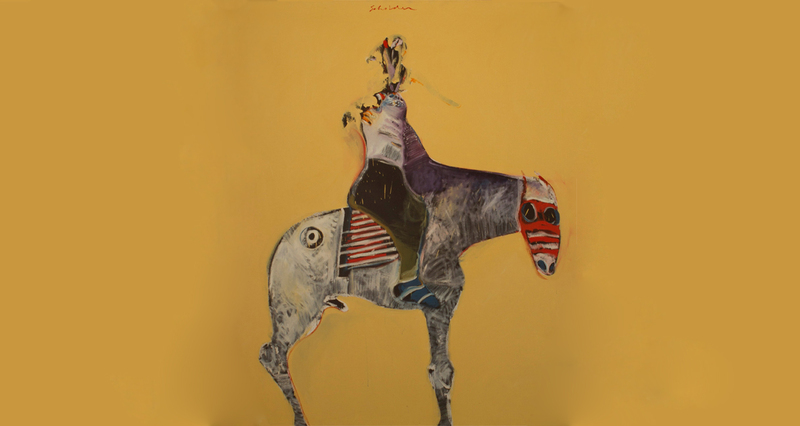 The subject matter in his work is strong but Scholder seems to have won the battle, to have transcended pure subject. His words above are important for artists in any genre to keep in mind. I know that that this act of transcendence is something I aspire to whenever I am before the easel. Sometimes I win and sometimes I don’t. 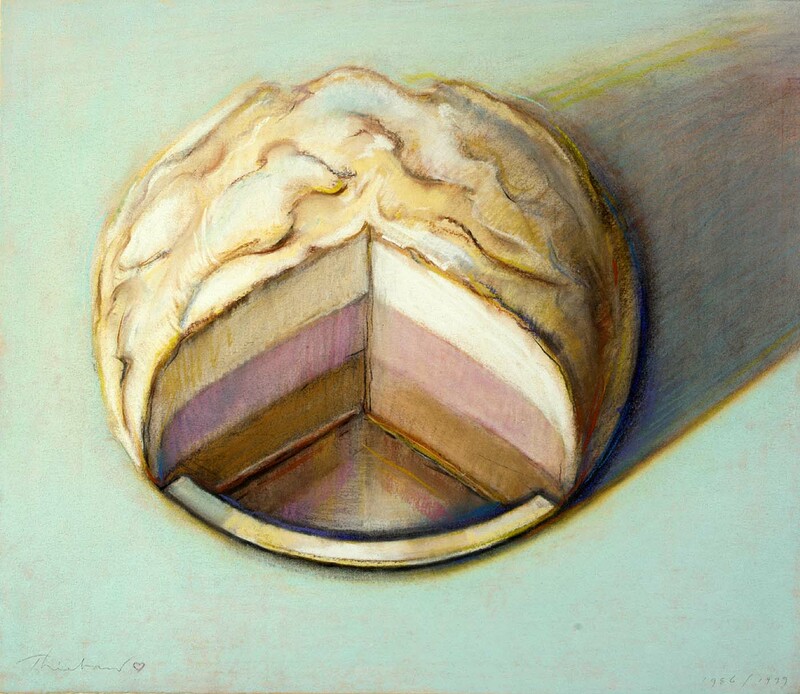 Commonplace objects are constantly changing… The pies, for example, we now see, are not going to be around forever. We are merely used to the idea that things do not change. 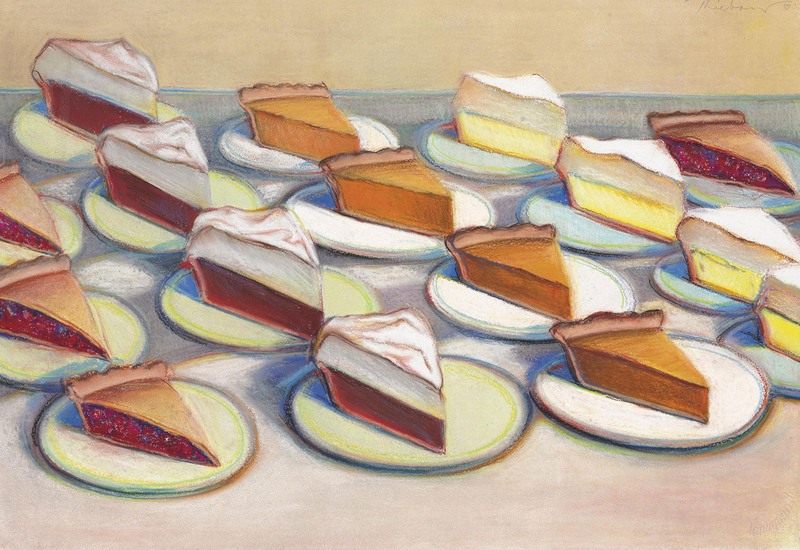 I am not really hungry this morning but I felt like looking at some pies. 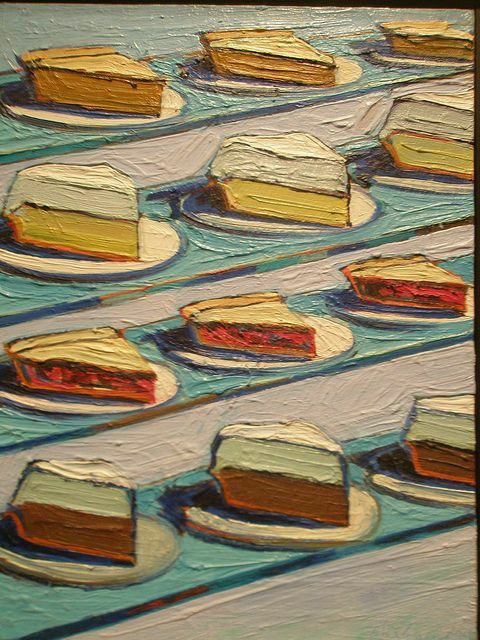 Well, paintings of pies. 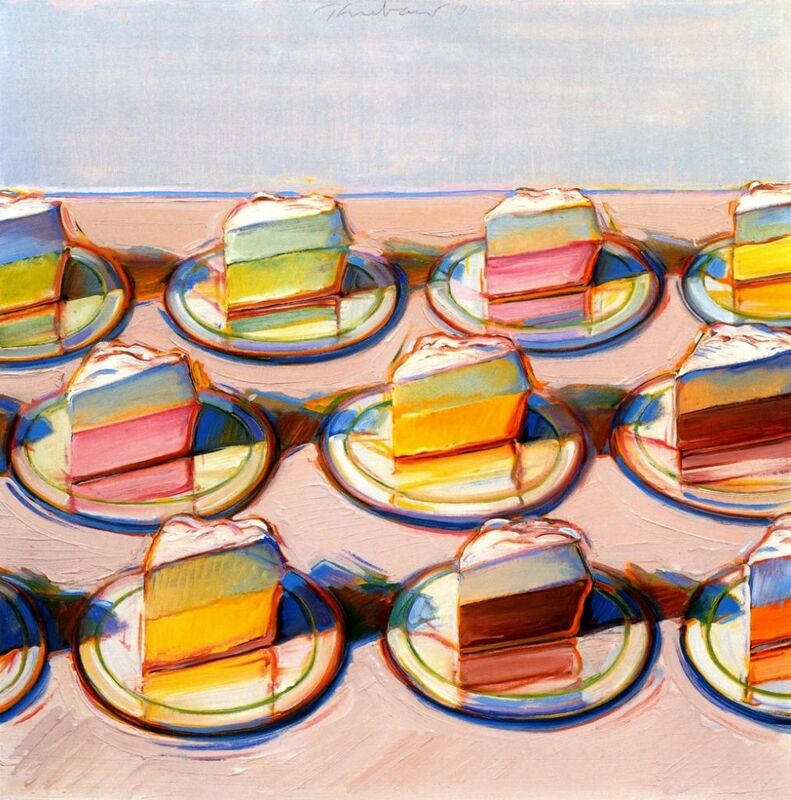 And more specifically, those from Wayne Thiebaud, a favorite of mine. He’s going to turn 98 years old in November. I am not sure if he is still painting but I think he probably is. He was still painting two years ago when the following short film was produced by Christie’s auction house. If you have five minutes I urge you to take a look. It has become a tradition for my Gallery Talks at the West End Gallery to have a very portion– a pretty popular one– that involves a drawing for those on hand to win one of my paintings. I have written in the past about how I take this very serious and try to find pieces that have meaning for me and which are, I believe, somehow overlooked. 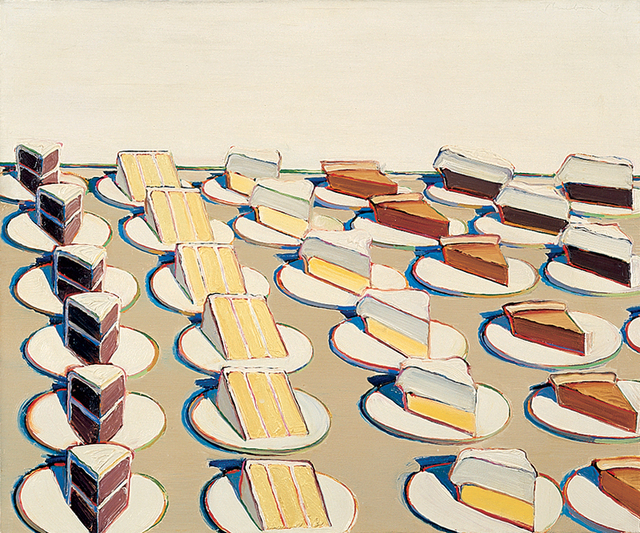 The painting I have chosen for this year’s Talk ( next Saturday, August 4 at 1 PM) definitely fits in that category. Shown below, it is called Pipedream. I have watched with consternation as it traveled around the country, always coming back to me. You see, it was a favorite of mine from the minute it was done. It just felt right with a warmth and clarity that appealed to me and with its Red Tree and Red Roof, it is very much a signature piece. I wracked my brain figuring out why this piece hadn’t found a home and all I could think was that this might be one of those cases where the title might be confusing if the viewer wasn’t aware of its origin. And if you knew what it meant, given the opioid crisis in this country, you might find it distasteful. But I saw it in the best sense of the word, as a perfect dream with solitude, rich fields, clear sunlight and calm blue skies. A perfect retreat from a crazy world. So, to clear things up I am running the post about this painting from a few years back. Hope you can make it to the Gallery Talk at the West End Gallery on August 4th to have a chance at winning this favorite of mine. Plus, as always, there is a little more at these talks. Put it on your calendar and come grab a seat. It could be fun. This is a small new painting that is about 6″ by 11″ on paper. I call it Pipedream after the old John Prine song, Spanish Pipedream. I say old but it ‘s one of those songs that never feels old to me despite the fact that it came out back in 1971, forty three years [47 now] ago. It is old. 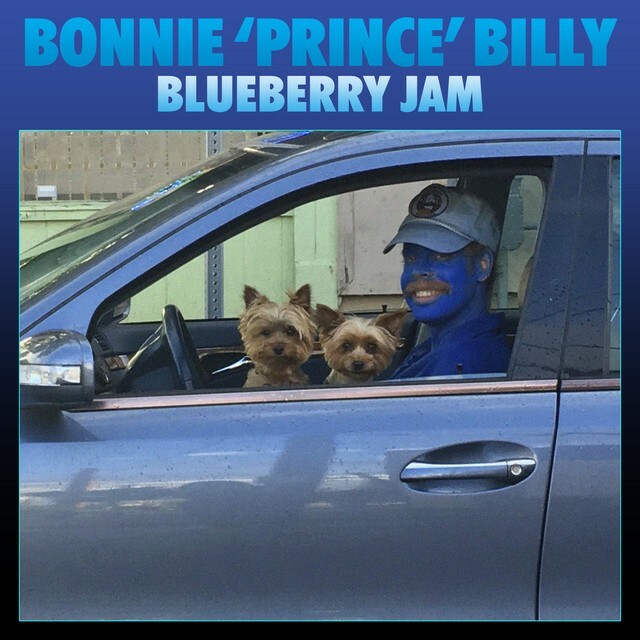 One hint of its age is at the beginning of the song when he says he was a soldier on the way to Montreal, referring to fleeing north into Canada to avoid the Viet Nam war and the draft. But it’s still such an infectious chorus with a message that so hits the point that I still find myself humming this song quite often. 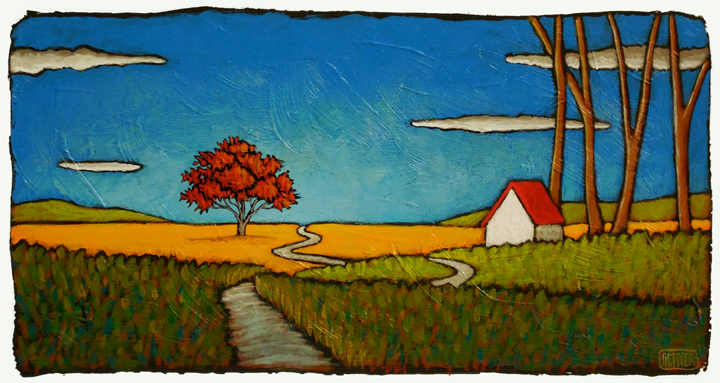 I guess this painting’s simplicity and cheery feel made me think of this song. There is something very idyllic and charmingly essential in this little guy. It does look a bit like a pipedream, which is one of those words that we often use while not thinking about its origin or meaning. This word, pipedream, is from Victorian era Britain and refers to an improbable fantasy or hallucination that came while smoking opium. Maybe this is an improbable fantasy? It does have a fantasy feel about it but lets hope it is not so improbable. Now here’s the song from one of my favorites, John Prine. I stumbled across this photo the other day and I have come back several times to look at it. 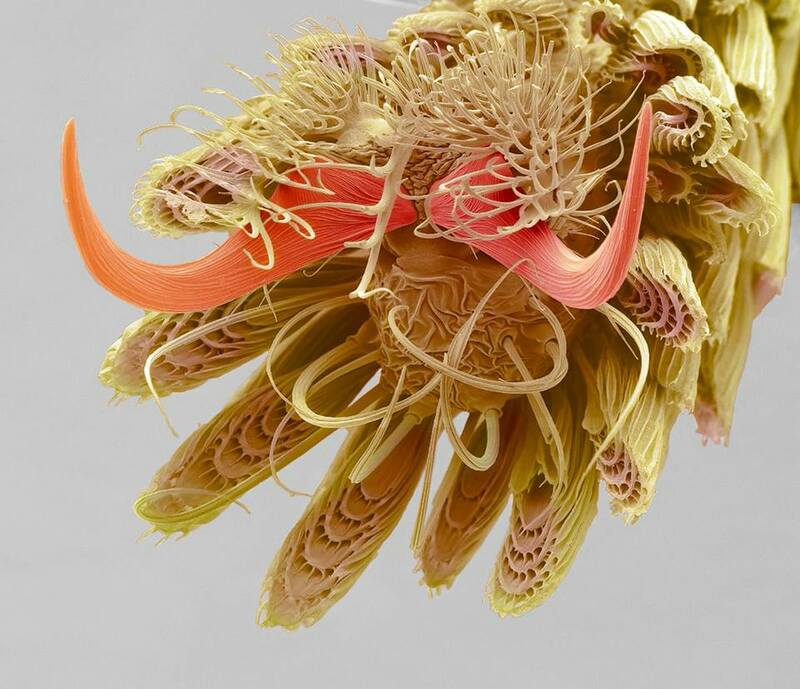 It’s the image of a mosquito’s foot at 800x magnification and there’s a strange organic beauty and weird delicacy to it that draws me in. The complexity of the individual elements in its design is fascinating. The reddish grabby claws have a certain elegance but I can only think that if a mosquito were the size of a housecat they could latch on to you with those claws and you would never be able to merely swat them off. Thankfully, I have yet to come across such a mosquito. I can only think that if something so common as a mosquito can seem so alien, even if beautiful, imagine how strange the truly alien might be. As the physicist Heisenberg points out, are we even capable of imagining such strangeness? 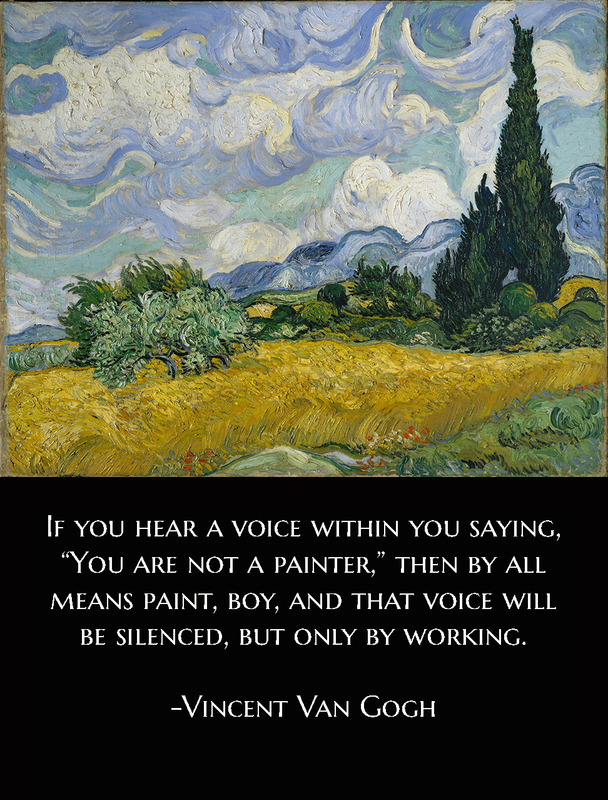 This short snip from a letter Vincent Van Gogh wrote to his brother, Theo, in October of 1883, might be the best piece of advice that any working or aspiring artist could receive. And it most likely applies to any other field of endeavor. I can’t speak for the experience of most artists but, concerning my own work and abilities, I travel through an internal landscape with soaring peaks of great confidence that often plummet into deep valleys of doubt. One moment and I am high on a peak with a seemingly endless view that shows me all sorts of ways forwards. But in the bat of an eye I find myself in a deep and dark ravine with no indications of any path on which I can climb out. I begin to doubt my abilities, begin to wonder if I have been the fool in thinking myself an artist. Ideas that just a day or so ago felt special and ready to burst out from me suddenly seem dull and lifeless. Inspiration dissipates like a mist in the sunlight. But, as the decades doing this have taught, the answer always comes in working. Empty the mind, push doubts to the side and pick up a brush. Make a mark. Then another and another. Let it lead you somewhere, let it be the path out of that valley.